If you're upgrading to OneNote 2016 from OneNote 2013, you'll still have all the features you're used to—and you'll notice a few new ones as well. The first thing you’ll see when you open OneNote 2016 is that it has the familiar look of 2013 with a more colorful border. You'll be able to take advantage of OneNote integration with other apps and services too. You can now embed videos from Office Mix, Vimeo and YouTube into a page in OneNote. For more about how to do this, see Insert online videos into OneNote. With Microsoft Edge, the new browser for Windows 10, you can write on the web. After you take notes, or highlight on a webpage, you can share your handiwork to OneNote. Learn more at the Windows How-to site. With me@onenote.com, you can send content from your inbox right to OneNote. Sending email to OneNote is a great way to store important content so you can find it quickly later. If you’re on the go and want to send yourself a reminder, just write a quick mail. Or, if you’re using an app with an "Email this" button, you can share it with yourself in email. 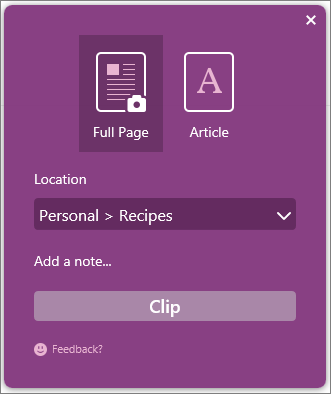 OneNote Clipper is another way to clip the web right to OneNote. When you open Clipper, you can choose to clip an entire page or just part of one. You can even choose what notebook and section to clip it to—so you'll know where to find it later. Clipper is a free app that you can get from onenote.com/clipper. Clipper sits on your browser's Favorites bar so it's at your fingertips when you need it. Office Lens is a phone app. It's a great way to capture notes and info from whiteboards, menus, signs, or anything with a lot of text. You don't need to jot down notes, rely on blurry pictures, or worry about misplacing your notes. It’s great for capturing sketches, drawings, and equations too, and even images without text. Office Lens gets rid of shadows and odd angles so images are easier to read. You can download Office Lens for free from the Windows Phone Store. Don't have a Windows Phone? No worries! Office Lens is available for iPhone and Android too. If you're upgrading to OneNote 2016 from 2010, you'll enjoy all the features listed above, and you'll find a host of other new features that were introduced in 2013. OneNote has a clean and simple look so you can focus on your notes, and not the user interface. Aside from visuals, you'll have lots of useful features too. The cloud is your file storage in the sky. In OneNote, it’s easy to create a notebook on OneDrive or to your organization’s site. From there, you can easily view, edit, sync, and share your notes and even work together with family members, colleagues, or classmates on the same notes at the same time. Is your notebook on your hard drive? You can move it to the cloud anytime. When you store your notebooks in the cloud, you can get to your notes on all your devices—including your Windows computer or tablets, Mac, smart phone, iPad or Android device. You can also use the free Office Online in virtually any browser. Smoothly draw, erase, and edit with your finger, stylus, or mouse on any touch-capable device, such as a Tablet PC or laptop with touch screen. If you need to share your handwritten notes and care about legibility, OneNote can automatically convert your handwriting to text. You can attach just about any computer file to any part of your notes, so you have a copy of the file in your notebook. You can also create or import Excel spreadsheets and Visio diagrams right within OneNote and edit their information in place in your notes. Identify and authenticate other authors more easily with the integrated identity profiles in OneNote. Search for notebook changes and revisions by authors’ names and view all recent edits when you return to a shared notebook. Join online meetings and share your notes from any supported device, even if Office isn’t installed. OneNote automatically saves and syncs everything while you work, so you can concentrate on your thoughts and ideas instead of your files. Use Instant Search to find anything you’ve ever created or saved in OneNote. 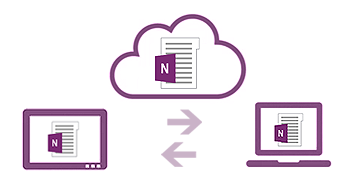 And if you ever need to share a snapshot of your notes with someone who doesn’t have OneNote, you can export your notes in a variety of file formats.